While I was visiting Panasonic and the VariCam 35 factory a couple of weeks ago, Theo van de Sande, ASC was shooting a TV Pilot with one of the first cameras. Here are his comments. A full report on the design and manufacturing of VariCam 35 will appear in FDTimes soon. 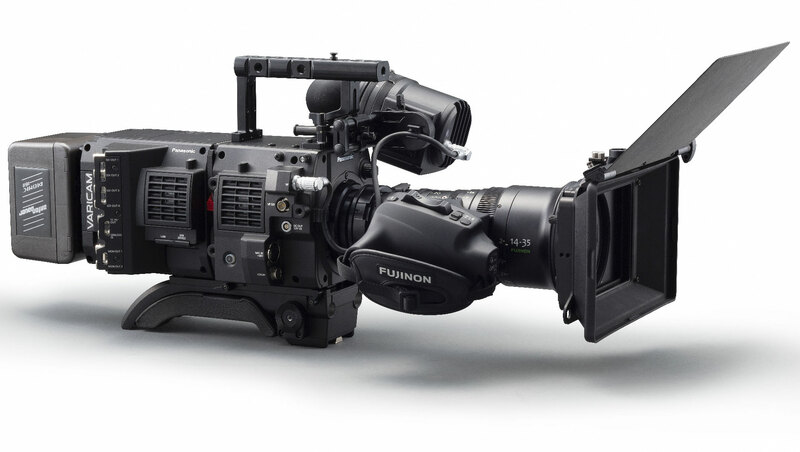 JON FAUER: You just finished a TV pilot with one of the first Panasonic VariCam 35 cameras. How did this happen? THEO VAN DE SANDE, ASC: Between features I have done many documentaries with my wife Michele Ohayon and continue to do them. During a documentary about autistic children we realized that 10 minutes maximum (one 400 ft roll of film loaded in the camera mag) was not good enough to capture the things we were after. So, for our documentaries, we then switched to a digital HD format while I kept shooting my Features on film. That was a long time ago, around 2000. The Sony 900 was the first HD camera we used, but I hated tape and switched immediately to one of the first Panasonic P2 cameras when they became available. I found that, although Panasonic was typically a TV company, with a TV-based camera, their cameras at that time could produce pretty good film-like images. That’s why a lot of independent filmmakers started to use the Panasonic camera. The later Panasonic cameras had also a Dynamic Range Stretcher (DRS) function and a very clean AVC-Intra100 compression codec. Couldn’t you up-rez the Alexa to 4K? We found that 35mm negative was at least comparable with 4K digital. And we were planning not to stop fighting until we would have a digital format that had at least as much resolution as 35mm negative, meaning 4K resolution. And now I found myself almost complaining about this “4K or higher resolution” request. Of course, I know that resolution is not the only important factor in good quality image, but it is a start. So after some thought, I was happy with it. Because the future of Digital Cinema and TV is all going to be 4K and UHD. Soon the cost of a 4K TV will be almost the same as an HD TV. Best Buy already sells 4K TVs for under $2000. So, I thought I needed to shoot with the Canon C500 or the Sony F55, Sony F65, or RED Epic Dragon, all systems I had used before. I decided to think about it for a day. That same day I happened to attend the Panasonic 4K demo at the ASC clubhouse. Panasonic showed us the completely new VariCam 4K and discussed how post-production on the set could mostly be dealt with from inside the camera. I played with the camera a little bit, looked at the images on a high quality monitor that was available. I tried out their new “native” low light setting of 5000 ISO, and said, “Wow–somehow this 5000 ISO rating has just given us something very special, with great quality, to use in extremely low light situations”. I said, “I have to believe you.” But in my heart, I didn’t, because I thought surely somewhere you have to give up some quality for that amount of sensitivity. The results on the 4K monitor that I saw–and later the demo reel–convinced me that the quality of the image was really very good. And then I thought that I could go wrong as long as the camera runs. And even if certain things were not 100 percent ready, I was going to use this camera because I have had good experiences on all the documentaries I did with Panasonic’s cameras. This was my first experience with the VariCam 35 camera. I worked with it for seven days. I love the idea of shooting simultaneously in 4K and 2K or proxy inside the camera itself. Immediately, I worked with the 5000 ISO setting because one of our locations was a very dark bookstore in downtown LA. With all the setups we had to do there would not have been enough time to light had we gone a traditional route. Shooting at 5000 ISO was “crazy.” It’s a completely different ball game. Your eyes are not used to it and we cinematographers are not used to it. I had to adapt very quickly to this new, low light level. The producers, director, writer, and Amazon people who visited the set were blown away. It was a very dark location, and what they saw on the monitor looked great. So, I just jumped into the deep water on my first day. I saw things show up on screen that I didn’t think would be possible. In the interior of the bookstore, a practical lamp of 100 watts at 20 yards away, or even the tally light, would “pollute” the set with extraneous illumination. I also was confronted with a whole new situation that I did not know of, something called “shot noise”. Panasonic made me aware of it and I researched it a little bit. It’s about the very small amount of photons that hit the pixels. It’s like when you flip a coin 10 times; it’s not going to be five times heads and five times tails. It’s going to be 6-4, 2-8, 3-7, or so, which means irregular exposure, a certain “new” type of noise But if you flip the coin a million times, it’s 50 percent. The last scene of the production was nighttime at Venice Beach. There was very little light. The shops were closed, but the arches of the buildings were still overexposed, lit by some small fixtures. The palm trees were silhouetted against night sky, and I lit a huge area with just one unit from 100 yards away. The bottoms of the palm trees were lit with the headlights of our camera truck. I lit the foreground with two battery-powered LED lights, one daylight and one tungsten, and that’s it. A lot of things were mind-boggling. Of course, we have to control the light in the same way as we always did, only with another approach. For the night shot at Venice Beach, what was your aperture? Were you wide open? I had a set of Leica Summilux T1.4 prime lenses from Otto Nemenz, who also provided the cameras and accessories. Yes, I used them wide open, T1.4, 5000 ISO. This was a unique opportunity and we were the first ones to try it. Amazon was really very bold. Almost any other broadcast company or studio would not have let me just go with a camera that wasn’t even on the market yet. The only thing that I found was–and they have to work on that—a minor detail where the ALEXA has an advantage. ALEXA is what I call a “stupid” camera. Why? Because, if you push the button on an ALEXA, if even a baby pushes the button –with the default Rec.709 setting–you still get a good image out of it. The RED is a different story. The Sony is a different story. The only time that I had a little problem was during the first day exterior. I used the V-Log (VariCam), but the default Rec.709 setting was not really good. The highlights were too overexposed. We knew how much detail there was in V-Log 4K. The Rec.709 default setting didn’t translate that. It should be more adjusted to the original dynamic range of the V-Log. This was the only thing that gave me (for one day) a little bit more difficulty in working outside in daylight. I made my own “default” LUT. Did you have a DIT? Yes, we had a DIT. I make a lot of frame grabs during the day. At the end of the day, I have sometimes 100 to 150 stills. Then I choose around 10 stills and send them by email to the director, the editor, the writer, the producer, and the post house so that everybody is on the same page and knows what kind of mood I am creating. That way I keep control over my image. It is of course not ideal but it gives you a 75% idea of the mood. Like using Polaroids in the film days. Completely the same. Although in film, you didn’t see dailies until the next day. I use the stills to show my look to other people. And to keep consistency. In post, one guy at night might do a color timing and create a different look/mood than the director and I worked on during the shoot. And the editor is viewing mostly very compressed images, and then the director gets used to that image. I want to give them, from the get-go, the correct image. That way I am not the bad guy when I arrive for the final color grading and wind up changing the image that they got used to during editing. I put all the stills that I’ve taken during the film in the order of the story. I work on my color correction in Lightroom on a big cinema display. When I go to the Digital Intermediate session, I take that monitor with me and let the timer look at my corrected images on my monitor. I’m not going to put it on some one else’s never-never matching big monitor. It saves a lot of time during the DI session and gives you the opportunity to work more on manipulating the images. It’s a lot of work. But it is very gratifying. In addition to 5000, were you shooting at the regular ISO? You mentioned the 3 data card slots. This is, in my opinion, genius. These slots are very small. You treat the 4K slot as if it were the digital negative.” You don’t touch that data. You have the SUB recorder slots where you can do all your work. (Editor’s notes: The VariCam35 is almost a Near-Set Cart in the Camera. It features Double Recording—you can record a clone simultaneously and you can also record lower-rez proxy files at the same time. The two MAIN recorder slots record 4K/UHD/2K/HD with AVC-ULTRA codecs (HD ProRes will be added) onto expressP2 card and legacy P2 cards. The two SUB Recorder slots record 2K/HD AVC-ULTRA and Proxy files onto microP2 cards. 2K/HD is plenty of resolution for editors who normally work on highly compressed AVID DNxHD36 images. The SUB Recorder slot lets you put almost your entire project on one little microP2 card, and that’s in the camera. You can review scenes or get a letterbox proxy version of the image, and you can download it at the end of the day. It’s lower quality, but it is enough to see your shots and more or less to know the mood. This SD card is like a video assist system living inside the camera and could in the future be another big game-changer for post-production and on-set viewing. So, you’re recording to a high-res master and you are essentially cloning copies in different resolutions in camera, in real time. You don’t have to touch the 4K. You download it. By the way, downloading AVC-ULTRA goes fantastically fast. The camera doesn’t have RAW yet. They are working with Codex. I hope it will not be too expensive. For the 30 super-big budget films that are made in America nowadays, it doesn’t matter. But for the smaller films, like the 5, 10, 15, million dollar films, it counts a lot. Tell me more about the Summilux-C lenses. We used the Leica Summilux-C primes from Otto Nemenz. And for zooms, we had Fujinons. I used a new Fujinon 25-300 mm and the 19-90 mm zooms. I also worked with the handheld Fujinon 15-45 mm zoom. These are all great lenses. This pilot was about a 36-year-old ex-supermodel who comes out of rehab after 10 years and still thinks she’s a supermodel, but the world has changed. I had to have scenes where she had to look very beautiful. The camera already produces very good skin tones, but for the beauty scenes I sometimes used the Schneider 1/8 Classic Soft filters. If you use two or more filters in front of the lens on a digital camera you can get double reflections much more often than with a film camera. The ND filter wheel in the VariCam 35 camera is very consistent and I didn’t have to work with a mixture of IRND and normal ND filters, which are rarely the same That’s a big deal to me. Consistency gives me confidence on the set. How did you get to use these early cameras? These weren’t prototype cameras. They were the first ones off the production line. The hardware was ready enough and I promised Panasonic that I was able to work with what was ready in the software. The 2K slot and 120 fps weren’t ready yet. I couldn’t use the VariCam 35 feature that lets you can separate the camera head from the body like an ALEXA-M. I had to use it as one piece. I trusted Panasonic. I had always been an early user of their new file-based cameras. This has been a fascinating discussion. Thank you so much. No problem. I’m happy to do this, because your work is phenomenal. I follow FDTimes all the time. Nobody else will go so deeply into a piece of equipment. And it helps us tremendously. I’m very thankful for somebody who does the research so unbelievably detailed that I can make my conclusions beforehand just by reading your articles. Thanks. Although this time, you’re the one who did the early research on the VariCam 35.